There is no better time for driving than the Fall. Crisp air and colorful scenery make for a fun, engaging day on the road. We explored backroads from Marshall to Skyline Drive on a gorgeous, clear, brisk day. 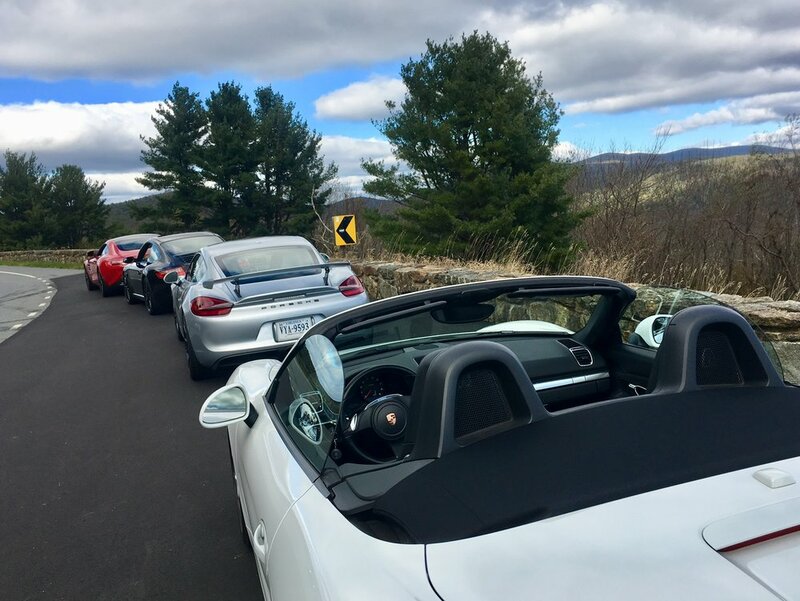 It was a Porsche-centric day with Members driving the Cayman GT4, 911 Carrera S, and the Boxster, as well as the Mercedes-Benz AMG GTS and their own great cars. Our first stop was at the delicious Red Truck Bakery in Marshall – we can’t resist their coffee and muffins to start the day! After fueling up with caffeine, we snaked over toward the Inn at Little Washington. Later, we stopped at Rappahannock Pizza Kitchen for a slice of fresh, artisan pizza made by hand there. Then we headed to the mountains. Skyline Drive rides the mountainous crest of the Blue Ridge Mountains. It a slow road, but you want to drive slowly here because around every corner is an amazing vista over more mountains or the nearby towns. You find yourself stopping at nearly every overlook because the view just demands it. Sure, we’d love to have the road closed to traffic to drive it at speed, but for now, we’ll have to just enjoy it at the pace of nature.